Start, finish and registration at Kinord Hall, Dinnet on the A93 between Aboyne and Ballater. Entry fee £10 + £2 for non-SAL members. Please pre-enter to help race administration & guarantee your goody bag! No pre-register = no goody bag!! Entry will be available on the day (subject to max. 150 runners). There is parking along the roadside on the A9158 between Dinnet and the River. There is also a limited number of parking spaces at the pay and display carpark within the village. Please car share where possible. The route starts a short distance North of Dinnet, along the A97. 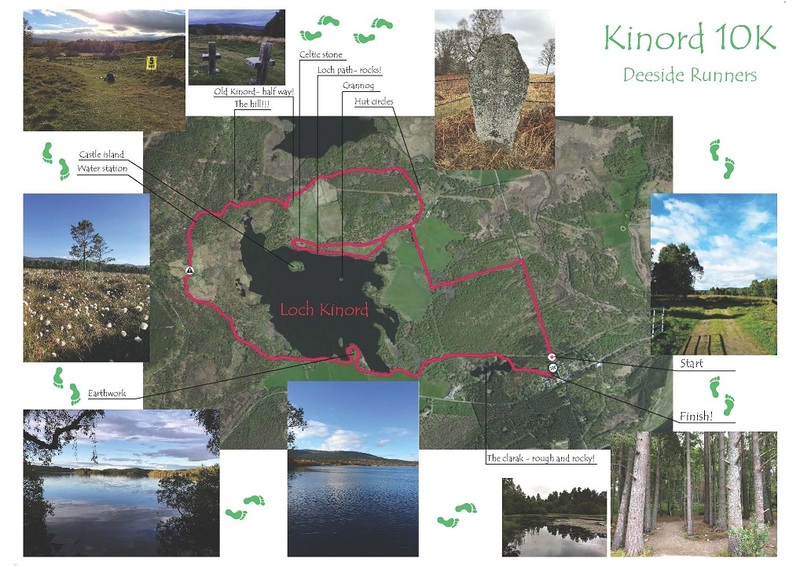 After following this road for a short distance, competitors are directed onto a farm track leading first to New Kinord and then on to the Celtic Cross on the northern shore of the loch. From there the route follows a narrow and in places rough track back along the norther shore of the loch to return to New Kinord. From there a grassy path is followed through woodland, past hut circles and the ruins of Old Kinord before climbing up to the water station at aprox. 6km. From here a good, grassy path descends to Bogingore from where it follows the marked circular route back to the finish at Dinnet via Meikle kinord, the earthworks and the Clarack loch. There is another rough section of path along the northern shore of the Clarack loch at 9Km. Although generally on good tracks and paths, trail shoes would be advised on the route, particularly when wet. Again please pre-register if possible (and to book your goody bag!) and we look forward to seeing you on the day!